Interior, Repair and Inspection Shed. While popularly and not inaccurately known as the "Subway System," the lines of the Interborough Company comprise also a large amount of trackage in the open air, and hence the rolling stock which has already been described is devised with the view to satisfying all the peculiar and special conditions thus involved. A necessary corollary is the requirement of adequate inspection and repair shops, so that all the rolling stock may at all times be in the highest state of efficiency; and in this respect the provision made by the company has been lavish and liberal to a degree. The repair and inspection shop of the Interborough Rapid Transit Company adjoins the car yards of the company and occupies the entire block between Seventh Avenue on the west, Lenox Avenue and the Harlem River on the east, 148th Street on the south, and 149th Street on the north. The electric subway trains will enter the shops and car yard by means of the Lenox Avenue extension, which runs directly north from the junction at 142d Street and Lenox Avenue of the East Side main line. The branch leaves the main line at 142d Street, gradually approaches the surface, and emerges at about 147th Street. The inspection shed is at the southern end of the property and occupies an area of approximately 336 feet by 240 feet. It is divided into three bays, of which the north bay is equipped with four tracks running its entire length, and the middle bay with five tracks. The south bay contains the machine-tool equipment, and consists of eighteen electrically driven machines, locker and wash rooms, heating boilers, etc., and has only one track extending through it. The construction of the inspection shops is that which is ordinarily known as "reinforced concrete," and no wood is employed in the walls or roof. The building is a steel structure made up of four rows of center columns, which consist of twenty-one bays of 16 feet each, supporting the roof trusses. The foundations for these center columns are concrete piers mounted on piles. After the erection of the steel skeleton, the sides of the building and the interior walls are constructed by the use of 3/4-inch furring channels, located 16 inches apart, on which are fastened a series of expanded metal laths. The concrete is then applied to these laths in six coats, three on each side, and termed respectively the scratch coat, the rough coat, and the fining coat. In the later, the concrete is made with white sand, to give a finished appearance to the building. The roof is composed of concrete slabs, reinforced with expanded metal laths and finished with cement and mortar. It is then water-proofed with vulcanite water-proofing and gravel. In this connection it might be said that, although this system of construction has been employed before, the building under consideration is the largest example of this kind of work yet done in the neighborhood of New York City. It was adopted instead of corrugated iron, as it is much more substantial, and it was considered preferable to brick, as the latter would have required much more extensive foundations. The doors at each of the bays of the building are of rolling steel shutter type, and are composed of rolled-steel strips which interloop with each other, so that while the entire door is of steel, it can easily be raised and lowered. All of the tracks in the north and middle bays are supplied with pits for inspecting purposes, and as each track has a length sufficient to hold six cars, the capacity of these two bays is fifty-four cars. The inspection pits are heated by steam and lighted by electric light, for which latter purpose frequent sockets are provided, and are also equipped with gas pipes, so that gas torches can be used instead of gasoline. As usual in shops of this kind, the third rail is not carried into the shops, but the cars will he moved about by means of a special trolley. In the middle bay this trolley consists of a four-wheeled light-frame carriage, which will run on a conductor located in the pit. The carriage has attached to it a flexible wire which can be connected to the shoe-hanger of the truck or to the end plug of the car, so that the ears can be moved around in the shops by means of their own motors. In the north bay, where the pits are very shallow, the conductor is carried overhead and consists of an 8-pound T-rail supported from the roof girders. 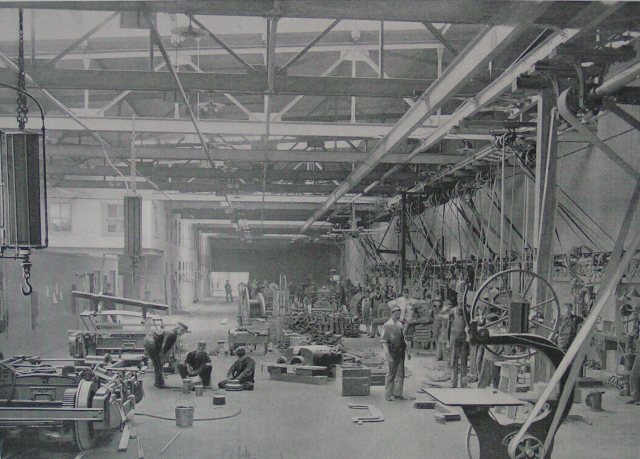 The middle bay is provided with a 50-ton electric crane, which spans all of the tracks in this shop and is so arranged that it can serve any one of the thirty cars on the five tracks, and can deliver the trucks, wheels, motors, and other repair parts at either end of the shops, where they can be transferred to the telpherage hoist. One of the most interesting features of the shops is the electric telpherage system. This system runs the entire length of the north and south bays crossing the middle bay or erection shop at each end, so that the telpherage hoist can pick up in the main room any wheels, trucks, or other apparatus which may be required, and can take them either into the north bay for painting, or into the south bay or machine shop for machine-tool work. The telpherage system extends across the transfer table pit at the west end of the shops and into the storehouse and blacksmith shop at the Seventh Avenue end of the grounds. The traveling telpherage hoist has a capacity of 6,000 pounds. The girders upon which it runs consist of 12-inch I-beams, which are hung from the roof trusses. The car has a weight of one ton and is supported by and runs on the I-beam girders by means of four 9-inch diameter wheels, one on each side. The hoist is equipped with two motors. The driving motor of two horse-power is geared by double reduction gearing to the driving wheels at one end of the hoist. The hoist motor is of eight horse power, and is connected by worm gearing and then by triple reduction gearing to the hoist drum. The motors are controlled by rheostatic controllers, one for each motor. The hoist motor is also fitted with an electric brake by which, when the power is cut off, a band brake is applied to the hoisting drum. There is also an automatic cut-out, consisting of a lever operated by a nut, which travels on the threaded extension of the hoisting drum shaft, and by which the current on the motor is cut off and the brake applied if the chain hook is wound tip too close to the hoist. The buildings are heated throughout with steam, with vacuum system of return. The steam is supplied by two 100 horse power return tubular boilers, located at the southeastern corner of the building and provided with a 28-inch stack 60 feet high. The heat is distributed at 15 pounds pressure throughout the three bays by means of coil radiators, which are placed vertically against the side walls of the shop and storeroom. In addition, heating pipes are carried through the pits as already described. The shops are well lighted by large windows and skylights, and at night by enclosed arc lights. The shops and yards are equipped throughout with fire hydrants and fire plugs, hose and fire extinguishers. The water supply taps the city main at the corner of Fifth Avenue and 148th Street, and pipes are carried along the side of the north and south shops, with three reel connections on each line. A fire line is also carried through the yards, where there are four hydrants, also into the general storeroom. The general storeroom, oil room, and blacksmith shop occupy a building 199 feet by 22 feet in the southwestern corner of the property. This building is of the same general construction as that of the inspection shops. The general storeroom, which is that fronting on 148th Street, is below the street grade, so that supplies can be loaded directly onto the telpherage hoist at the time of their receipt, and can be carried to any part of the works, or transferred to the proper compartments in the storeroom. Adjoining the general room is the oil and paint storeroom, which is separated from the rest of the building by fire walls. This room is fitted with a set of eight tanks, each with a capacity of 200 gallons. As the barrels filled with oil and other combustible material are brought into this room by the telpherage system they are deposited on elevated platforms, from which their contents can be tapped directly into the tank. The final division of the west shops is that in the northeastern corner, which is devoted to a blacksmith shop. This shop contains six down-draught forges and one drop-hammer, and is also served by the telpherage system. Connecting the main shops with the storeroom and blacksmith or west shops is a rotary transfer table 46 feet 16 13/16 inches long and with a run of 219 feet. The transfer table is driven by a large electric motor, the current being supplied through a conductor rail and sliding contact shoe. The transfer table runs on two tracks and is mounted on 33-inch standard car wheels. The south side of the shop is fitted with offices for the Master Mechanic and his department. The working force will comprise about 250 in the shops, and their lockers, lavatories, etc., are located in the south bay.